The time between each frame is not known because this clip is in slow motion. Amanda Beard's time for this race was 2:25.52. Frame #1: Amanda Beard has achieved a flat streamlined position and is about to initiate opening her hands. Frame #2: The hands begin to spread with no outward pitch on the hands. 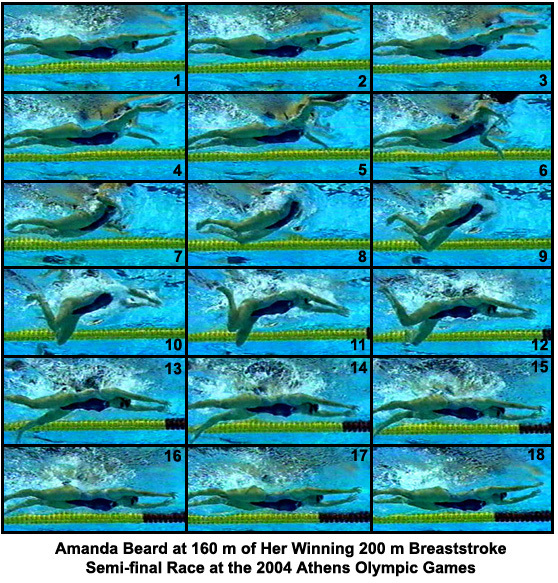 [This demonstrates that Amanda Beard does not execute an outward or inward scull in her stroke.] The head begins to rise. Frame #3: Both arms begin to bend at the elbow. Slight medial rotation of the upper arms is initiated. The wrists flex and begin to press down and out. The head continues to rise. [The reason the swimmer begins to lift her head so early in the stroke is that her huge vertical movement requires a long time to be completed. Consequently, she has to start early in the stroke.] The body is still streamlined. Frame #4: The elbows bend and the hands press down and out. Abduction of the upper arms occurs. The forces created by the arms have considerable vertical and horizontal components. A large vertical component is required to produce the large vertical movement that is integral in her stroke. The head rises. Hyperextension of the thoracic region of the spine allows the shoulders and head to rise while the remainder of the body remains streamlined. Frame #5: Abduction of the upper arms continues. The propulsive surface of each arm is the undersurface of the upper arm to the fingers. As the head and shoulders continue to rise, pure abduction is actually at an angle to horizontal. This swimmer is generating great force to elevate the upper body and head. Horizontal propulsion is compromised by this elective action. The mid-torso, hips, and legs remain streamlined. Frame #6: Abduction of the upper arms has become adduction. The slope of the forearms dictates the amount of vertical force relative to horizontal force that is created. At this frame arm-propulsion is complete. The mid- and upper-torso rise as the head and upper body rise further. Frame #7: The swimmer displays exceptional hyperextension of the spine that produces a position where the legs are horizontal and the shoulders and head are vertical. The arms adduct inward at the same time as the elbows flex more. The hands "slice" inward with the thumbs leading. The legs still trail horizontally. Frame #8: The top half of the swimmer's body and arms are out of the water. [It is hard to imagine the level of effort and amount of energy needed to produce this position.] The legs begin to bend at the knees preparatory to kicking. Frame #9: The legs continue to be drawn up. The hands, arms, shoulders, and head are thrust mainly forward and slightly downward. Frame #10: The legs continue to be drawn up. The upper body and arms continue to be thrust forward and slightly downward. Frame #12: The legs have accelerated in the kick. The body and arms are almost straight. Because of the magnitude of the vertical component in the recovery return into the water, it is not possible for the swimmer to be perfectly streamlined. To assist in halting the downward movement, the legs will kick back and slightly down leaving the swimmer in a slightly arced alignment. Frame #13: The kick continues to be impressive. From the wide starting point in Frame #11, the legs have kicked backward with an expansive leg area presented as the propulsive surface. The body and arms are streamlined allowing the kick to propel the swimmer in a position of least resistance. Since the arms and hands point slightly down the legs will have to kick slightly downward to maintain a horizontal body position. Frame #14: The kick is completed. It should be noted that the legs kicked straight back to a position of full knee extension. Frame #15: The legs start to come together. Frame #16: As the legs come together they also rise, which causes the arms to rise as a counterbalancing action. Overall streamline is improved. Frame #17: The legs and arms continue to rise. Frame #18: A position similar to that exhibited in Frame #1 is attained. Amanda Beard's stroke is effective but not for the reasons that seem patently obvious. First, there is no sculling action in the arm movement. The hands are spread to a position that mimics one that might occur in butterfly stroke. Then propulsion is delivered in a manner that is very similar to the first portion of a butterfly stroke pull. Halfway through the "butterfly pull", propulsion is abruptly terminated and the hands sliced inward and upward. This direct pull stroke is similar to that exhibited by the most recent world-champion and record-holding swimmers. Second, the huge elevation of a large portion of the body mass is energy consuming and not mechanically efficient. However, the extra force added to the leg kick that is generated by the dive and drive forward after breathing offsets some of the loss in efficiency of this action. Third, the "wave" movement is an artifact of the large vertical component in the overall movement pattern. It would be a very real error to consciously teach a swimmer to try and do this. It should eventuate naturally as a result of the technique taught, not from direct instruction. Fourth, Amanda Beard actually does a very long glide under water. Her upper body and arms are streamlined and not moving from Frame #12 through #18, fully one third of the stroke cycle. Long periods spent in a streamlined glide position, particularly with the torso, head, and arms, is a characteristic of the most recent champion breaststrokers. Fifth, the swimmer's hyperflexible upper back allows her to achieve positions with the upper body that do not cause streamline changes in her lower body and legs. Forces created by arm propulsion produce this action and negate the requirement for counterbalancing in the lower portion of her body.